Outside of the Schengen visa required, I have always been afraid that the scale would perhaps be mind-numbing and nauseating? A dear friend from London, Ruaraidh Adams-Cairns, who has written a book on the Somme and guides there regularly, kindly invited us to join him on these tragic sites. The challenges for the British soldiers, often attacking uphill across open killing fields, against well-trained German soldiers who had taken care to entrench thoroughly were almost insurmountable. As with almost all battlefields, one needs to look beyond the strategy, when lions were being led by donkeys, and try to focus on individual human stories. Ruaraidh achieves this masterfully, and the nauseating reality was replaced instead by awe at the power of the human spirit, and the bonds between ordinary human beings in those ghastly trenches. 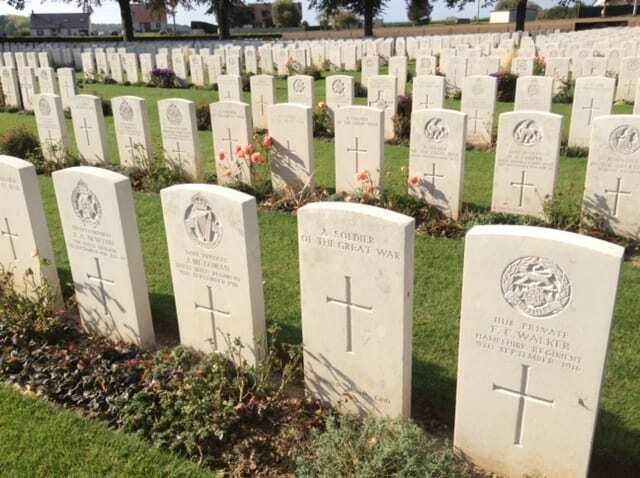 Importantly, the British cemeteries (there are 1500 cemeteries on the Somme!) are places of Remembrance, whereas the German cemeteries are places of Sorrow. Regularly we wept looking at graves of teenage boys whose lives had not yet even begun. Imagine the grief of a mother requesting “Will some kind hand in a foreign land place a flower on my son’s grave”? The inscriptions from wives with children back home-it was moving and tragic beyond words. We drove through numerous French villages, destroyed by artillery, and rebuilt on their original footprints using German funds. Fascinating that Jan Smuts felt the terms at the end of the war were so punitive against Germany that they may lead to a Second World War – how right he proved to be!